WASHINGTON, WASHINGTON DC, UNITED STATES, February 6, 2019 /EINPresswire.com/ -- Recently, GoodFirms published a noteworthy Email Marketing Survey1 that spots some light on how marketers can strategize and implement the best practices to approach their email marketing challenges. In this survey, get explored to a handful of findings of email marketing and compare it with your advertising tactics to get ahead from your competitors. This survey was performed among 100+ marketing companies as well as experts from the same domain. The participant's marketers were from various industry segments and from across countries like Australia, Canada, Czech Republic, India, Singapore, South Africa, the United Kingdom, and the United States. 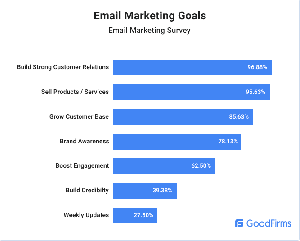 Here is the list of Digital Marketing Companies that are indexed at GoodFirms and who contributed their knowledge in this survey by revealing the effective trends, tactics and top challenges faced in email marketing. Email marketing is an affordable way to increase brand awareness, reach the audience that can drive results. Here in this survey, 97% of marketers believe email marketing is the best way to reach the goal to build a strong relationship with customers and make it a powerful platform to grow the business. At GoodFirms you can get connected with Top Email Marketing Companies2 that are listed along with genuine ratings and reviews. GoodFirms is a globally acknowledged B2B research, ratings and reviews platform. It builds a bridge for the service seekers to get associated with top companies, best software, and other excellent firms from a varied range of industries. The analyst team of GoodFirms conducts an in-depth assessment that includes several qualitative and quantitative research metrics. GoodFirms research team identifies the complete past and present portfolio, years of experience in their domain area, market penetration, client feedback and many more. After this process, all the firms are compared to each other and then index the exceptional agencies in the list of top companies as per their expertise. Moreover, GoodFirms encourage service providers to engage in on-going research and show strong evidence of their work. It provides an opportunity to get indexed in the list of top companies according to the proficiency and a great platform to be visible to customers from every corner of the world. Check out the curated list of Top Digital Marketing Agencies3 worldwide at GoodFirms that are indexed based on three vital criteria’s Quality, Reliability, and Ability. GoodFirms is a Washington, D.C. based research firm that aligns its efforts in identifying the most prominent and efficient web development companies that deliver results to their clients. GoodFirms research is a confluence of new age consumer reference processes and conventional industry-wide review & rankings that help service seekers leap further and multiply their industry-wide value and credibility.